Femoral shaft fractures constitute only 1.6% of all paediatric fractures but at the same time they are the most common fractures which require hospitalization in children . Etiology varies from child abuse and trivial trauma in smaller children to high energy trauma in adolescents [2-5]. Conservative management with Hip spica cast is the standard method used universally for children less than 6 years of age with excellent results [6-9]. However, controversy continues to exit in literature about the ideal treatment method above 6 years till skeletal maturity though. In the last decade surgical stabilization is preferred over conservative management for paediatric femoral shaft fractures [9,10]. Many fixation methods are used for paediatric femoral fractures depending on age, fracture pattern, weight and surgeon preference. Various studies have proven submuscular plating as an excellent method for femoral shaft fractures with distinct advantages of this method over other surgical methods . Submuscular plating can be effectively used for proximal and distal femur fractures where other surgical methods are not feasible. However most of the studies reported about submuscular plating have reported short term results. The purpose of this study was to evaluate the long term results of submuscular plating in paediatric femoral shaft fractures. This is a prospective study conducted between January 2008 to December 2017 after approval from ethical committee. Patients were operated between January 2008 to December 2010 and followed up till December 2017. Total 37 cases with closed femoral shaft fractures with age between 7 years to 16 years were included in the study. Patients with open, associated neurovascular injuries, age below 7 years and above 16 years were excluded from the study. Complete information about patient demography, fracture characteristics, intra-operative and post-operative findings, radiological findings, Intraoperative or post complication, infection, hardware related problems, fracture union, implant breakage, refracture in the follow up and limb length discrepancy was maintained. All the cases were done on fracture table using in line traction under fluoroscopic guidance. Preoperative anteroposterior and lateral view x ray of femur were taken to see the type of fracture (Fig 1a). In the post-operative period patients were regularly followed up in the OPD and sequential X rays were taken on first postoperative day (Fig. 1b. ), 3 weeks, 6 weeks, 12 weeks (Fig. 1c.) and around 8 or 9 months. After that patients were called yearly for the follow up. Fig 1a. Pre-operative x-ray showing unstable fracture. Fig 1b. Post-operative x-ray of the same patient. Fig 1c. X-ray showing well united fracture. Post operatively toe touch weight bearing was allowed from 4th week and full weight bearing was allowed as per status of fracture union on radiological assessment. Implant removal was done between 8 to 34 months depending on patientâs request. 3 out of 5 patients didnât turn up for complete follow up. 1 patient was lost in the 2nd year, 1 in 4th year and 1 in 5th year of follow up. Total 37 patients with 23 boys and 14 girls were included in the study. The average age of the patients was 12.3 years (range=7-16 years). 27 patients were with right femur fracture and 10 with left femur fracture. All the patients had unilateral femur fracture. 23 patients were having isolated femur fracture and 14 were cases of polytrauma. Road traffic accidents and fall from height were the most common modes of trauma. 34 out of 37 patients regularly followed up during the full duration of the study. The average follow up duration was of 442 weeks (364 weeks to 520 weeks). 34 patients were skeletally mature (fused proximal femoral physis) by final follow up. 14 fractures were comminuted, 11 were spiral, 9 were oblique and 3 were transverse as shown in Table 1. Table 1. Patient morphology and fracture data. There was no case of intra-operative or post-operative complications. 4 cases of surgical site infection were reported which were treated by antibiotics and regular dressings. No case of deep infection was reported. The approximate blood loss in both the surgeries (index surgery and implant removal) was 77 ml (65 ml to 180 ml) per patient and average fluoroscopy time was 55 minutes (39 min to 102 min). The average time of callous formation was 3.2 weeks (2.7-4.5 weeks) and fracture union was 8.2 weeks (6.5-14 weeks). Implant related complications (local tenderness or pain while walking) were seen in 2 patients. In both the cases implant was removed at the 8th month after surgery. The implant removal was done from 8th to 42th month after surgery. In 4 cases 1 or multiple broken screws were seen time of implant removal and were left as such. There was no case f functionally disabling malunion after at final follow up. There were 2 cases of varus and 3 cases of valgus malunion (but none of it was more than 10 degrees. There was no case of functionally disabling or progressive varus or valgus deformity seen during the study. 5 cases of limb length discrepancy were observed with 2 cases of shortening and 3 cases of lengthening. However only one case ended up with significant lengthening of more than 2 cm (2.3 cm) after skeletal maturity. No case of non-union or refracture was reported in our study. However, 3 cases of delayed union were seen where fracture union time was more than 12 weeks. 2 cases of implant breakage were reported in our study. One case had a fall and other case had early weight bearing. Both cases were treated by open plating and did well in the follow up. The average surgical time, blood loss and fluoroscopy time decreased, and length of plates used increased from average 10.5 holes in the first year to 13 holes in the 3rd year of study. Most of the complications like malunion, limb length discrepancy and implant breakage occurred in patients who were operated in the first year of study. With experience and better understanding of principles of the technique all the parameters improved in the patients operated in 3rd year of the study as shown in Tables 2 and 3. Table 2. Intra-op, post-op and long term follow up observations. Table 3. Year wise break up of results. Historically treatment of femoral shaft fractures in paediatric age group varies from conservative methods like pavlik harness and hip spica for children below 6 years to various operative methods in the adolescent age group. In the last decade the trend is shifting more towards surgical intervention because of advantages like quick recovery, early mobility, and lesser time for hospitalization but controversy continues to exist in literature about best method in paediatric age group . Various surgical methods used in paediatric femoral fractures include open or submuscular plating, retrograde elastic nailing, antigrade rigid nailing or external fixation. Antigrade rigid nailing through Trochantric tip is considered to be very good method for femoral fractures for late adolescent age group [13-16]. However, complications like damage to Trochantric physis and avascular necrosis have been reported with this method, besides this method is not feasible for fractures involving proximal and distal ends of femur fractures [17-21]. Retrograde elastic nailing is another method used for fixation of femoral shaft fractures. However, the indications of this method are limited to mid shaft length stable fractures and patients with weight less than 45 kg [22-26]. Many studies have shown higher incidence of complications like malunion and implant irritation with this method more in patients with unstable fractures and obesity [27-33]. External fixation is another method used for femoral shaft fractures mostly in open fractures and polytrauma patients [34-38]. Higher chances of refracture, scar formation and pin site infection make this method less acceptable [39,40]. Plate osteosynthesis remains a viable option for most of the femoral shaft fractures in paediatric age group [41-43]. Open plating allows anatomical reduction however higher incidence of complications like excessive bleeding, ugly scar, infection and non-union makes this method less popular . Submuscular bridge plating is increasingly being used for paediatric femoral fractures with advantages of preserving fracture biology, less blood loss, smaller scar and lesser chances of infection compared to open plating [45-47]. The advantages of plating over other surgical methods is that it can be used for both stable and unstable fractures, pathological fractures, fractures of proximal and distal end of femur and patients with narrow medullary canal and deformed femur where intramedullary nailing is not possible [48,49]. A number of studies have shown excellent results with submuscular plating in paediatric femur shaft fractures with minimal complications [50,51]. Stuphen et al. in their comparative study between retrograde elastic nailing, rigid anigrade nailing and submuscular bridge plating showed maximum complications with elastic nailing and best results with respect to early callous formation, early mobility and least implant related complications with submuscular plating . The average time of callous formation in our study was 3.2 Weeks and radiological fracture union at an average of 8.5 weeks. 5 patients in our study had varus/valgus mal union of less than 10 degrees however they didnât have any functional disability. Samora et al. in their study observed similar findings in their study on submuscular plating . Many studies have shown the plate length to be the predictor for successful outcome as longer plates makes the construct less stressful by distribution the stress over a larger surface area [54,55]. We observed implant breakage in 2 patients where implant of proper size was not used. Both the cases were done in the beginning of the study but with better understanding of the principles of the technique we didnât observe such complication subsequently. Our plate length increased from average 10.5 holes in the first year to 13 holes in the 3rd year of study. Abott et al. in their comparative study between open and submuscular plating showed more complications implant breakage and need of unplanned revision surgeries more in open plating than submuscular plating . One of the complications attributed to the submuscular plating is limb length discrepancy. We observed 5 cases of limb length discrepancy, however only 1 case had significant LLD of more than 2 cm. May et al. in their study 1% case of limb lengthening of more than 3 cm for which epiphysiodesis was done . Implant removal was done between 8 to 34 months after surgery. 1n 7 cases we have to prolong incision to take out the implant because of excessive bone growth around the plate. In three patents screw breakage occurred during implant removal. No complications accured in any of such patients in the follow up. The bone growth around the plate and difficulty in removing the plate was not related to the timing of implant removal. Pate et al. in their study also observed that bone growth around the plate and difficulty in removing the plate was independent of the time of implant removal . Most of the studies on submuscular plating have shorter follow up. We believe our study is the first study on submuscular plating with long follow up till skeletal maturity which makes our observations about complications like limb lengthening, non-union and implant related complications more reliable. Sub-muscular plating is a surgical method with learning curve and is a very effective method of fixation for paediatric femur fractures. It has definitive advantages over other surgical methods and is associated with minimal complications. Towseef Ahmad Bhat designed the study and drafted the manuscript. Tariq Ahmad Bhat and Khalid Muzaffer participated in the design of the study. Mohammad Haseeb participated in design and coordination and helped to draft the manuscript. All authors read and approved the final manuscript. Hinton R.Y., Lincoln A., Crockett M.M., et al. : Fractures of the femoral shaft in children. Incidence, mechanisms, and sociodemographic risk factors. J Bone Joint Surg Am. 1999;81:500-509. Loder R.T., ODonnell P.W., Feinberg J.R.: Epidemiology and mechanisms of femur fractures in children. J Pediatr Orthop. 2006;26:561-566. Beals R.K., Tufts E.: Fractured femur in infancy: the role of child abuse. J Pediatr Orthop. 1983;3:583-586. Rewers A., Hedegaard H., Lezotte D., et al. : Childhood femur fractures, associated injuries, and sociodemographic risk factors: a population-based study. Pediatrics. 2005;115:e543-e552. Hedlund R., Lindgren U.: The incidence of femoral shaft fractures in children and adolescents. J Pediatr Orthop. 1986;6:47-50. Irani R.N., Nicholson J.T., Chung S.M. : Long-term results in the treatment of femoral-shaft fractures in young children by immediate spica immobilization. J Bone Joint Surg Am. 1976;58:945-951. Infante A.F., Albert M.C., Jennings W.B., et al. : Immediate hip spica casting for femur fractures in pediatric patients. A review of 175 patients. Clin Orthop Relat Res. 2000;376:106-12. Ferguson J., Nicol R.O. : Early spica treatment of pediatric femoral shaft fractures. J Pediatr Orthop. 2000; 20:189-92. Madhuri V., Dutt V., Gahukamble A.D., et al. : Interventions for treating femoral shaft fractures in children and adolescents. 2014. Kocher M.S., Sink E.L., Blasier R.D., et al. American Academy of Orthopaedic Surgeons American Academy of Orthopaedic Surgeons clinical practice guideline on treatment of pediatric diaphyseal femur fracture. J Bone Joint Surg Am. 2010;92:1790-1792. Li Y., Hedequist D.J. : Submuscular plating of pediatric femur fracture. J Am Acad Orthop Surg. 2012;20:596-603. Rakesh J., Siddhartha S., Gopinathan N.R., et al. : Current Concepts in Paediatric Femoral Shaft Fractures. Open Orthop J. 2017;11:353-368. Reynolds R.A., Legakis J.E., Thomas R., et al. : Intramedullary nails for pediatric diaphyseal femur fractures in older, heavier children: early results. J Child Orthop. 2012;6:181-188. Keeler K.A., Dart B., Luhmann S.J., et al. : Antegrade intramedullary nailing of pediatric femoral fractures using an interlocking pediatric femoral nail and a lateral trochanteric entry point. J Pediatr Orthop. 2009;29:345-351. Kanellopoulos A.D., Yiannakopoulos C.K., Soucacos P.N. Closed, locked intramedullary nailing of pediatric femoral shaft fractures through the tip of the greater trochanter. J Trauma. 2006;60:217-222. Townsend D.R., Hoffinger S.: Intramedullary nailing of femoral shaft fractures in children via the trochanter tip. Clin Orthop Relat Res. 2000;376:113-118. Beaty J.H., Austin S.M., Warner W.C., et al. : Interlocking intramedullary nailing of femoral-shaft fractures in adolescents: preliminary results and complications. J Pediatr Orthop. 1994;14:178-183. Mileski R.A., Garvin K.L., Huurman W.W.: Avascular necrosis of the femoral head after closed intramedullary shortening in an adolescent. J Pediatr Orthop. 1995;15:24-26. Mileski R.A., Garvin K.L., Crosby L.A.: Avascular necrosis of the femoral head in an adolescent following intramedullary nailing of the femur. A case report. J Bone Joint Surg Am. 1994;76:1706-1708. OâMalley D.E., Mazur J.M., Cummings R.J.: Femoral head avascular necrosis associated with intramedullary nailing in an adolescent. J Pediatr Orthop. 1995;15:21-23. GonzÃ¡lez-Herranz P., Burgos-Flores J., Rapariz J.M., et al. : Intramedullary nailing of the femur in children. Effects on its proximal end. J Bone Joint Surg Br. 1995;77:262-266. Ligier J.N., Metaizeau J.P., Prevot J., et al. : Elastic stable intramedullary nailing of femoral shaft fractures in children. J Bone Joint Surg Br. 1988;70:74-77. Flynn J.M., Hresko T., Reynolds R.A., et al. : Titanium elastic nails for pediatric femur fractures: a multicenter study of early results with analysis of complications. J Pediatr Orthop. 2001;21:4-8. Bhuyan B.K., Mohan Singh S.: Titanium elastic nailing in pediatric femoral diaphyseal fractures in the age group of 516 years - A short term study. J Clin Orthop Trauma. 2014;5:203-210. Lascombes P., Haumont T., Journeau P.: Use and abuse of flexible intramedullary nailing in children and adolescents. J Pediatr Orthop. 2006;26:827-834. Saikia K., Bhuyan S., Bhattacharya T., et al. : Titanium elastic nailing in femoral diaphyseal fractures of children in 616 years of age. Indian J Orthop. 2007;41:381-385. Moroz L.A., Launay F., Kocher M.S., et al. : Titanium elastic nailing of fractures of the femur in children. Predictors of complications and poor outcome. J Bone Joint Surg Br. 2006;88:1361-1366. Luhmann S.J., Schootman M., Schoenecker P.L., et al. : Complications of titanium elastic nails for pediatric femoral shaft fractures. J Pediatr Orthop. 2003;23:443-447. Parikh S.N., Jain V.V., Denning J., Complications of elastic stable intramedullary nailing in pediatric fracture management: AAOS exhibit selection. J Bone Joint Surg Am. 2012;94:e184. Wall E.J., Jain V., Vora V., et al. : Complications of titanium and stainless steel elastic nail fixation of pediatric femoral fractures. J Bone Joint Surg Am. 2008;90:1305-1313. Narayanan U.G., Hyman J.E., Wainwright A.M., et al. : Complications of elastic stable intramedullary nail fixation of pediatric femoral fractures, and how to avoid them. J Pediatr Orthop. 2004;24:363-369. Sagan M.L., Datta J.C., Olney B.W., et al. 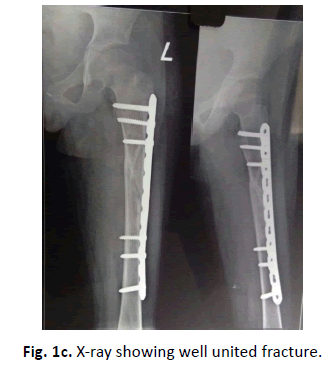 : Residual deformity after treatment of pediatric femur fractures with flexible titanium nails. J Pediatr Orthop. 2010;30:638-643. Sink E.L., Gralla J., Repine M.: Complications of pediatric femur fractures treated with titanium elastic nails: a comparison of fracture types. J Pediatr Orthop. 2005;25:577-580. Mooney J.F. : The use of âdamage control orthopaedicsâ techniques in children with segmental open femur fractures. J Pediatr Orthop. 2012;21:400-433. Miner T., Carroll K.L. : Outcomes of external fixation of pediatric femoral shaft fractures. J Pediatr Orthop. 2000;20:405-410. Hedin H., Hjorth K., Larsson S., et al. 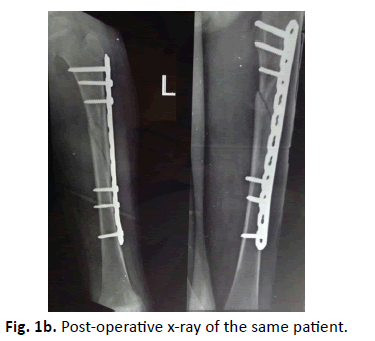 : Radiological outcome after external fixation of 97 femoral shaft fractures in children. Injury. 2003;34:287-292. Evanoff M., Strong M.L., MacIntosh R.: External fixation maintained until fracture consolidation in the skeletally immature. J Pediatr Orthop. 1993;13:98-101. Matzkin E.G., Smith E.L., Wilson A., et al. : External fixation of pediatric femur fractures with cortical contact. Am J Orthop. 2006;35:498-501. Skaggs D.L., Leet A.I., Money M.D., et al. : Secondary fractures associated with external fixation in pediatric femur fractures. J Pediatr Orthop. 1999;19:582-586. Gregory P., Pevny T., Teague D.: Early complications with external fixation of pediatric femoral shaft fractures. J. Orthop. Trauma. 1996;10:191-198. Caird M.S., Mueller K.A., Puryear A., et al. : Compression plating of pediatric femoral shaft fractures. J Pediatr Orthop. 2003;23:448-452. Ward W.T., Levy J., Kaye A.: Compression plating for child and adolescent femur fractures. J Pediatr Orthop. 1992;12:626-632. Fyodorov I., Sturm P.F., Robertson W.W., et al. : Compression-plate fixation of femoral shaft fractures in children aged 8 to 12 years. J Pediatr Orthop. 1999;19:578-581. Collin May., Yi-Meng Yen., Adam Y.: et al. 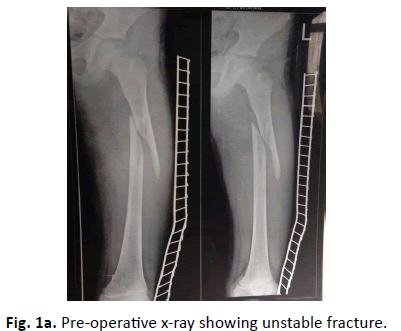 Complications of plate fixation of femoral shaft fractures in children and adolescents. J Child Orthop. 2013;7:235-243. Hedequist D.J., Sink E.: Technical aspects of bridge plating for pediatric femur fractures. J Orthop Trauma. 2005;19:276-279. Eidelman M., Ghrayeb N., Katzman A., et al. : Submuscular plating of femoral fractures in children: the importance of anatomic plate precontouring. J Pediatr Orthop B. 2010;19:424-427. Kanlic E.M., Anglen J.O., Smith D.G., et al. : Advantages of submuscular bridge plating for complex pediatric femur fractures. Clin Orthop Relat Res. 2004;426:244-251. Agus H., Kalenderer O., Eryanilmaz G., et al. : Biological internal fixation of comminuted femur shaft fractures by bridge plating in children. J Pediatr Orthop. 2003;23:184-189. Hammad A.: Locking plate construct for femoral shaft fractures in skeletally immature patients. Acta Orthop Belg. 2008;74:630-635. Abdelgawad A.A., Sieg R.N., Laughlin M.D., et al. : Submuscular bridge plating for complex pediatric femur fractures is reliable. Clin Orthop Relat Res. 2013;471:2797-2807. Sean A.S., Juan D.M., Andre C.M., et al. Paediatric diaphyseal femur fractures: submuscular plating compared with intramedullary nailing Orthopedics. 2016;39:353-358. Walter P.S., Micheal G., Leisel W., et al. : Submuscular bridge plating for length_unstable paediatric femur fractures. J Pediater Orthop. 2013;33:797-802. Sink E.L., Hedequist D., Morgan S.J., et al. : Results and technique of unstable pediatric femoral fractures treated with submuscular bridge plating. J Pediatr Orthop. 2006;26:177-81. Rosburch S.R., Muller U., Gautier E., et al. The evolution of femoral shaft technique. Clinical Orthopaed Related Res.1998;354:195-208. Mathew D.A., Randal T.L., Jeffery O.A. : Comparison of sunmuscular and open plating of pediatric femur fractures: A retrospective Study. J Pediatr Orthop. 2013;33:519-523. Pate O., Hedequist D., Leong N., et al. :1 Implant removal after submuscular plating for pediatric femur fractures. J Pediatr Orthop. 2009;29(7):709-712.